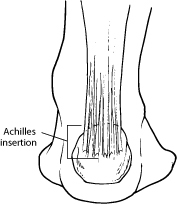 Immobilization may involve the use of a cast or removable walking boot to reduce forces through the Achilles tendon and promote healing. To reduce swelling due to inflammation, apply a bag of ice over a thin towel to the affected area for 20 minutes of each waking hour. Do not put ice directly against the skin. Nonsteroidal anti-inflammatory drugs (NSAIDs), such as ibuprofen, may be helpful in reducing the pain and inflammation in the early stage of the condition. 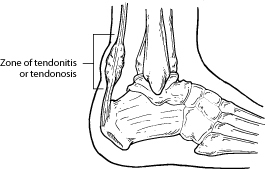 For those with over-pronation or gait abnormalities, custom orthotic devices may be prescribed. Physical therapy may include strengthening exercises, soft-tissue massage/mobilization, gait and running re-education, stretching, and ultrasound therapy.